Hello you beautiful girls. This is my debut post on MyFashionVilla. My name is Monali. I am a homemaker, a writer and now an author on MyFashionVilla. I am going to share a few product reviews for you. I will share reviews of the products which I have tried and tested well and really worked for me. So lets get started. 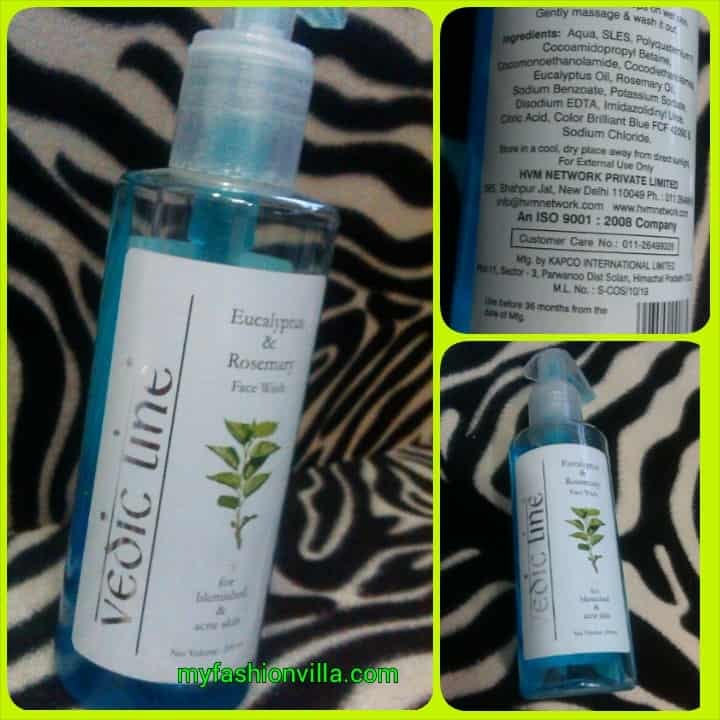 Today I am going to review Vedic Line Eucalyptus & Rosemary Face Wash. I have been using it since last one month, and now I am ready to share the review of it. I have got very much sensitive skin. New products give me breakouts so I don’t change my skincare products frequently. The problems I am facing are: Dry and Blemished skin with Pimples Occassionally. A few months back I shared the same roblem with Hetal and she recommended me Vedic Line Eucalyptus & Rosemary Face Wash. I used it and now sharing my review. Vedic Line Face wash soft and gentle to skin the ingredients, The Eucuplyptus is an antiseptic that helps to generate new cells for the blemished skin and the Rosemary stimulates the nervous system and rejenuvates the skin. Apply a few drops on the wet skin. Gently Massage& wash it out. Aqua, SLES, Polyquaterium 7, CocoamidopropylBetaine, Cocomonoethanolamide, Cocodiethanolamide, Sodium Benzota, PottassiumSorbate, Eucalyptus Oil, Rosemary Oil, Disodium EDTA, Imidazolidinyl Urea, Citric Acid, Color Brilliant Blue Fcf 42090 & Sodium Chloride. PACKAGING: It comes in a Transperant Plastic bottle with a spray dispenser. The bottle is sturdy and the spray dispenser allows the right amount of face wash.
MY EXPERIENCE WITH THE VEDIC LINE FACE WASH. I usually stick to the same brand of the cosmetic range. Since last one year my skin has become so dry and blemished and could see the acne marks on it too. Initially, when Hetal suggested me this facewash, I was afraid to switch to an unknown product as it was the skin to suffer if it does not work. I have tried this face wash since 30 days and I can see changes in the texture of my skin. Most importantly, it has eucalyptus in it. It gives the cooling effect when used. Clears my skin from the bottom layer and removes all the impurities from the skin. I was surprised to see the effect after a week. I could feel my skin smooth and supple and all the pigmentation was slowly vanishing. I have been using this face wash for one month and have a remarkable change in my skin. The blue color used is also pleasant to eyes. Makes skin smooth and supple removing all the impurities. What I Dislike about the product. Not available in all cities. You have to buy it online. Share Your Views in Comments..